The Martha Washington Inn is considered to be one of the most haunted places in Virginia. If you are searching for haunted places to stay, particularly a haunted inn, you are likely to find this structure to be absolutely perfect as far as accommodations are concerned. 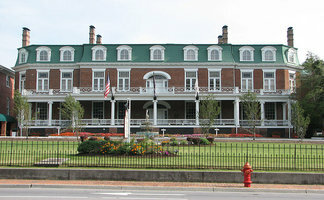 The Marsha Washington Inn is considered a historic landmark located in the State of Virginia. It is located in the City of Abingdon. The structure was constructed in the year of 1832. A General by the name of Francis Preston built the structure to serve the purpose of providing a home to his family which included his wife and nine children. The General was often recognized as the “Hero” of the conflict known as the “War of 1812”. Throughout this guide, you will be introduced to the history and hauntings associated with the Martha Washington Inn. As mentioned previously, the structure that is now known as one of the most haunted places in Virginia was constructed by Francis Preston for his family in the year of 1832. Amazingly, the total costs associated with the building were only $15,000.00. The beautiful home remained in the family until the year of 1858. It was during this year that the founders of the college known as the “Martha Washington College” purchased the home. The founders purchased the building so that it could be transformed into a higher educational facility for women. The transition was successful and the college opened and remained in full operation for seven decades. Unfortunately, an interesting twist of fate was soon set to fall upon the college. What happened next to the building is perhaps one of the most monumental events involving the haunted history of the Martha Washington Inn. The Civil War started in the United States and the structure served as an area for training individuals that were part of the Confederate Army of the region called the “Washington Mounted Rifles”. In addition to acting as a place where soldiers could be trained for their militant services in the war, the school was transformed into a hospital where sick and injured soldiers could be treated. Many individuals during this time started referring to the grand establishment as “The Martha”. Individuals that worked at the college and took classes at the college had to act in favor of the events taking place on the grounds – many even became nurses that helped the sick and injured that arrived at the school. As time progressed, many events occurred in the world that had a detrimental impact on the Martha Washington College building. One of the most significant events was the outbreak of typhoid fever. During the time of the outbreak, there were not many public sewage systems within the United States. Typhoid became a relatively common condition which is transmitted from food products and water that was contaminated in one way or another with feces from individuals carrying the infection or those carrying the bacterium which is called “Salmonella Enterica Enterica”. At one point in the early 1900s, the condition was so prevalent that it affected one hundred people out of every one hundred thousand in the United States. In addition to the sicknesses and deaths that occurred as a result of the typhoid fever, the Great Depression also had a detrimental impact on the school. More and more students were forced to leave the school because of the declining economy. The school found that many did not enroll for the same reason. As a result, the school started losing more money than it was bringing in. The Martha Washington College eventually came to a point where it had to close its doors to students. In the year of 1932, the school finally closed for good. The school stood abandoned until the year of 1935. It was at this time that it went from being known as the Martha Washington College to the Martha Washington Inn. Throughout the history of the haunted inn, many notable individuals have resided at the inn. Examples of these people include Harry Truman, Jimmy Carter, Eleanor Roosevelt, and several others. •	Many individuals throughout history have stated that they have observed a horse that is phantom based in the south region of land associated with the Martha Washington Inn. It is said that the Confederate Soldiers attacked the Union Soldiers that made their way into the City of Abingdon in the year of 1864. A Union Soldier was struck in the head by a bullet and he was taken to the building of the inn in order to be treated and his horse was tied to a tree in the south lawn. At approximately midnight, the soldier passed away. The horse was said to stand alert all night waiting for his owner, but in the morning hours, he disappeared forever. There are many that claim that they have seen the horse moving around the area at night, but upon investigation, the horse vanishes. •	There is a story that surrounds a young lady that attended the college and the man that she fell in love with. The man that she loved was a Confederate Soldier that had a very dangerous position in the military. He was responsible for informing the notable General named Robert E. Lee where the Union Army was stationed at. Before he set out on his new mission, he wanted to see his girlfriend to bid his final farewell. He used secret tunnels and stairs to gain entrance into the building – which served as the college at that time – and see his love. Unfortunately, he was immediately located and shot by two Union Soldiers and fell dead at his girlfriend’s feet. Apparently, the bloodstain that resulted from the gunshot wound that tragic day continues to reappear on the floor – despite efforts to clean and cover it. •	When the Martha Washington College opened its doors to the sick and injured soldiers during the Civil War, there was a student that took on the responsibilities of a nurse to care for the individuals that were brought in for medical reasons. Her name was Beth. She was a beautiful, kind-hearted girl that thoroughly enjoyed playing the violin. She ended up with the responsibility of caring for a Union Soldier. While caring for him, she would often play beautiful music to comfort him. In the course of caring for him, they fell in love. One day, he finally died. Despite the fact it broke her heart, she knew he was no longer suffering. Just three weeks after his death, Beth died of the typhoid fever that was affecting many of the time. Many individuals claim that the violin music can still be heard sometimes and others report that Beth’s apparition has been seen in and around the room identified as “403” in the building. •	When visiting the haunted Martha Washington Inn, you should ask the locals about the spirit that is said to be residing in the tunnel that seems to be extremely angry. Once, the structure was connected to a theater called the “Barter” through the means of a tunnel. Many individuals that walked between the structure and the theater often complained that an evil presence was felt. The spirit that was said to be in the haunted inn’s tunnel has often been described as being “ominous” and even “malevolent”. The exact identity of the spirit is not known. •	If you are interested in visiting one of the most haunted places in Virginia, you should consider visiting the basement of the Martha Washington Inn. At one point in history, it is said that slaves were held hostage in the basement and when they died, their remains were placed in the walls of the basement. Today, many claim that the spirits of these slaves still remain in this region of the haunted inn. If you are interested in haunted places to stay, you should consider making your reservations at this haunted inn. As stated previously, the Martha Washington Inn is considered to be one of the most haunted places in Virginia. Throughout the history of the structure, there have been many stories surrounding the spirits that played a role in the colorful history of the structure. Today, you can experience the paranormal activity of the haunted inn for yourself. Simply take the time to book your stay today so that you can share your experiences at the Martha Washington Inn tomorrow. Check for the lowest price, get directions, view photos, and read the reviews and traveler tips for the Martha Washington Inn.